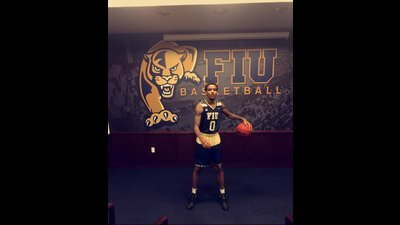 Josh Stamps arrived on his visit to Florida International on Friday. The next day, he ended his recruitment. The 6'5" guard will be taking his talents to sunny Dade County. The Windy City native, by way of Texas, has committed to the FIU Panthers. Stamps excelled for the Curie High School Condors in Chicago. In his junior season, a dunk he had in a game against Montverde was nominated for SportsCenter's Top Ten plays. He made the 2015 Sun-Times All-City third team his senior season and was recruited by a number of schools. While his skills on the court were above par, his academics prevented him from committing to a four year institution. Because of this, Stamps chose to enroll at a JUCO. After considering his options, the Condor became a Cardinal. He migrated south and enrolled at Trinity Valley CC in Athens, TX, who were coming off a 28-5 season. TVCC finished with an impressive 33-2 record in '15-'16. Stamps did his part by averaging 12.5ppg on 46% shooting, with a high of 26 points, which he achieved twice. For his efforts, he received an honorable mention for the All Region XIV's North Zone team. "Josh is a very talented guard and will do a great job at FIU," said former longtime Cardinal assistant, now head coach Guy Furr. "We are expecting big things from him this season." Stamps was also recruited by Iowa State, Kent State, DePaul, Missouri, Pacific, Morehead State, and UTEP. The biggest factor in his decision to join the FIU Panthers was the opportunity for playing time. "The starting two guard [Donte McGill] is graduating and they want me to fill his spot." Stamps, along with fellow D1 commits Amaad Wainwright (North Texas) and Hyron Edwards (Texas Tech), are poised to continue their winning ways and look to return to Hutchinson in March. The Cardinals were picked third in the NJCAA D1 preseason poll released yesterday. He hopes to replicate last year's success while working on his game. "My strenghts are getting to the basket, spotting up, and shooting off the dribble. I need to improve my dribbling skills." FIU is led by fourth year head coach Anthony Evans. The Panthers finished with a 7-11 record in CUSA play, and a 13-19 overall record. Stamps is their first commit for the '17-'18 season. Stamps is excited to wear the blue and gold next season. "[FIU fans] should expect me to come in big and be a big time scorer and leader and to bring my A game every game. Nothing less."